Last 10 created groups. 10 recently created group accounts. Last 10 changed groups. 10 recently changed group accounts. Group types. This report shows different types of group accounts belong to. Most populated groups - displays the top 10 groups with the largest number of users. Sparsely populated groups - displays the top 10 groups with the smallest number of users. Groups without users are not displayed here. Active vs inactive groups. The program assumes that active groups have at least one member while inactive groups have no users at all. Admin vs non-Admin groups - shows statistics about Administrator privileges of the groups. Last 10 created aliases. 10 recently created alias accounts. Last 10 changed aliases. 10 recently modified alias accounts. Alias types. This report shows different types of alias accounts belong to. Most populated aliases - displays top 10 aliases with the largest number of users. Sparsely populated aliases - displays top 10 aliases with the smallest number of members. Aliases without users are not displayed. Active vs inactive aliases. The program assumes that active aliases have at least one user while inactive aliases have no members at all. Admin vs non-Admin aliases - shows how many aliases have Administrator privileges. 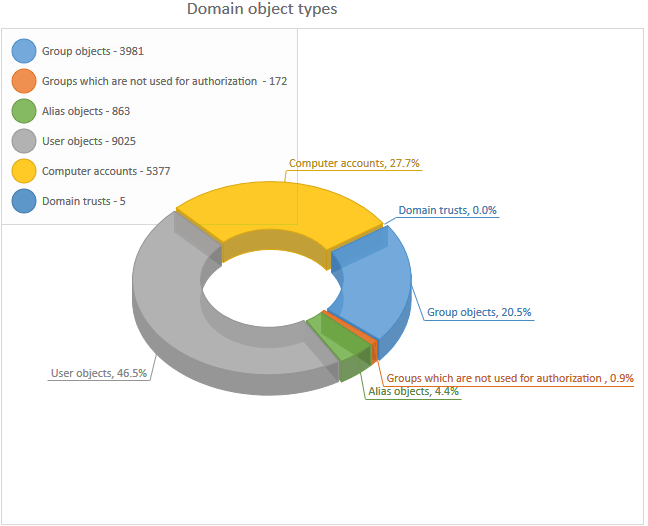 Domain object types - shows information about all found objects in a domain. For example: users, groups, computer accounts, domain trusts, etc.